Well folks a big deed has been done. 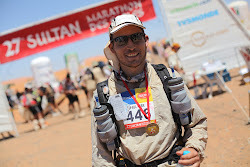 After asking lots of different people for their opinions on kit choice for the MDS, I have gone and ordered nearly all of the things I will need. I will publish the full kit list once I have it in my hands and have had a chance to determine the finalised contents of my pack based on weight and size. I have gone for the minimalistic approach on all items except the survival ones. As my sleeping bag may or may not be warm enough I ordered a Raidlight Micropolar fleece that will keep me warm in bed if need be. I can also wear that at night in the camp. Besides the clothes that I will be wearing whilst running the only others I will take with me (besides the lightweight fleece mentioned above) are a Montane Slipstream Quantum GL jacket and Montane Featherlite pants. For the running shorts I will either go with Nike Tempo 2 in 1 shorts or Brooks Infiniti Notch shorts depending on which I find most comfortable. For the top half I have opted for a RailRiders long sleeved Eco-Mesh top, and I will be wearing a Raidlight Sahara Cap on my head. I will also take one multi-purpose Buff with me. I have opted to forgo the comfort of a sleeping pad as quite a few people mentioned they managed easily without, and I will forgo a pillow as most people used their bags or clothes for this. I will not be taking a stove and fuel with me as all the meals that I bought can also be rehydrated with cold water. The only luxuries I am likely to take are my camera, a small travel toothbrush, a small tube of toothpaste and a pair of earplugs (apparently a must if you want a good nights sleep). The only items I am currently missing are the mandatory 10 safety pins and spare batteries for the headtorch, a few items of first aid and some energy bars and energy drinks powder. All of these can easily be obtained in one shopping trip in Zurich city centre. I haven't totted up the total weight yet, and I may be able to reduce some of it by getting rid of packaging etc, but I have chosen my kit carefully so I hope that the pack weight will be at the lighter end of the scale. It will be a lot easier for me to run if I am not struggling with backache from a heavy pack the whole way round. Obviously after the first day the pack will start getting lighter as I begin eating the food. By the end of the race I can imagine it will feel like a feather on my back compared to the first day.